Chip design and verification engineers often write as many as ten lines of test-bench code for every line of RTL code that is implemented in silicon. They can spend 50% or more of the design cycle on verification tasks. Despite this level of effort, nearly 60% of chips contain functional flaws and require re-spini. Because HDL simulation is not sufficient to catch system-level errors, chip designers now employ FPGAs to accelerate algorithm creation and prototyping. Using FPGAs to process large test data sets enables engineers to rapidly evaluate algorithm and architecture tradeoffs quickly. They can also test designs under real-world scenarios without incurring the heavy time penalty associated with HDL simulators. System-level design and verification tools such as MATLAB® and Simulink® help engineers realize these benefits by rapidly prototyping algorithms on FPGAs. This article describes best practices for creating FPGA prototypes with MATLAB and Simulink. The best practices are listed below and highlighted in Figure 1. Prototyping algorithms on FPGAs gives engineers increased confidence that their algorithm will behave as expected in the real world. In addition to running test vectors and simulation scenarios at high speed, engineers can use FPGA prototypes to exercise software functionality and adjacent system-level functions, such as RF and analog subsystems. Moreover, because FPGA prototypes run faster, larger data sets can be used, potentially exposing bugs that would not be uncovered by a simulation model. 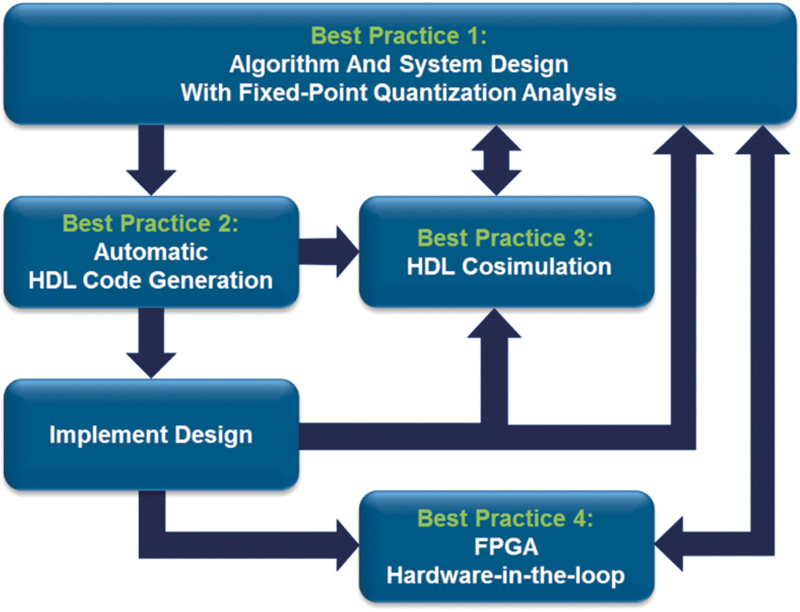 Figure 1 - Model-Based Design best practices for FPGA prototype development. Model-Based Design using HDL code generation enables engineers to efficiently produce FPGA prototypes, as shown in Figure 2. This figure illustrates the practical reality that engineers often abbreviate the detailed design phase in an attempt to begin the hardware development phase to meet development schedules. In practice, engineers will revisit the detailed-design phase during the HDL creation phase as they discover that the fixed-point algorithm is not meeting system requirements. This overlap contributes to an elongated HDL creation phase as depicted by the long purple bar and may result in design compromises, such as glue logic or design patches. Because automatic HDL code generation is a faster process than hand-coding, engineers can invest some of the time savings to produce higher quality fixed-point algorithms in the detailed design phase. This approach enables engineers to produce higher quality FPGA prototypes faster than with a manual workflow. 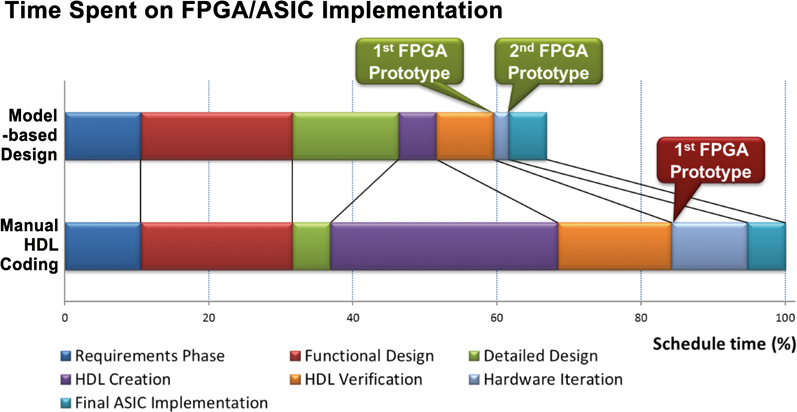 Figure 2 - Comparison of Model-Based Design and manual workflow timelines for FPGA prototyping and ASIC implementation. To illustrate best practices for FPGA prototyping using Model-Based Design, a digital down converter (DDC) serves as a useful case study. A DDC is a common building block in many communications systems (see Figure 3). It is used to transform high-rate passband input into low-rate baseband output, which can be processed using lower sample rate clocks. This results in lower-power, lower-resource hardware implementation. Figure 3 - Communications system employing a digital down converter. Figure 4 - System model of a digital down converter. to a floating-point reference. 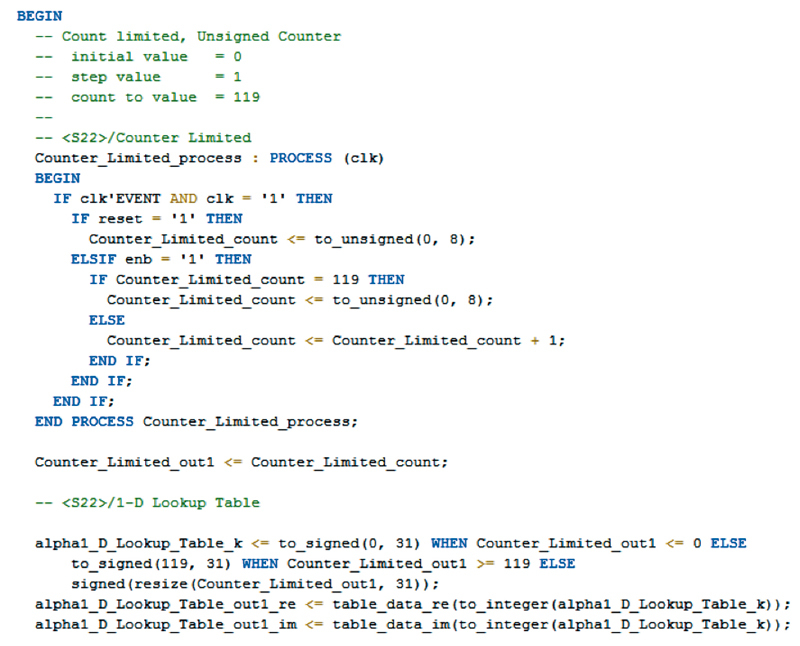 Nor is it easy to analyze the HDL implementation for overflows. To make intelligent decisions on the required fraction lengths, engineers need a way to compare the floating-point simulation results against fixed-point simulation results before starting the HDL coding process. Increasing the fraction length reduces quantization errors; however, such increases mean that word length needs to be increased (for more area and more power consumption). Figure 5 - Quantifying the effect of fixed-point quantization using Simulink Fixed Point. 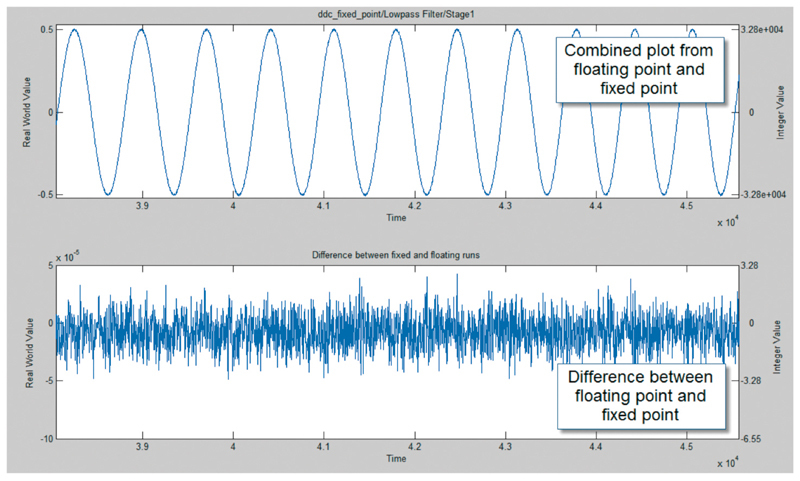 For example, Figure 5 illustrates the differences between the floating-point and fixed-point simulation results for stage one of the low-pass filter in the DDC filter chain. These differences are due to fixed-point quantization. The top graph shows an overlay of floating-point and fixed-point simulation results. The bottom graph shows the quantization error at every point in the plot. Depending on the design specification, engineers may need to increase fraction lengths to reduce the introduced quantization error. 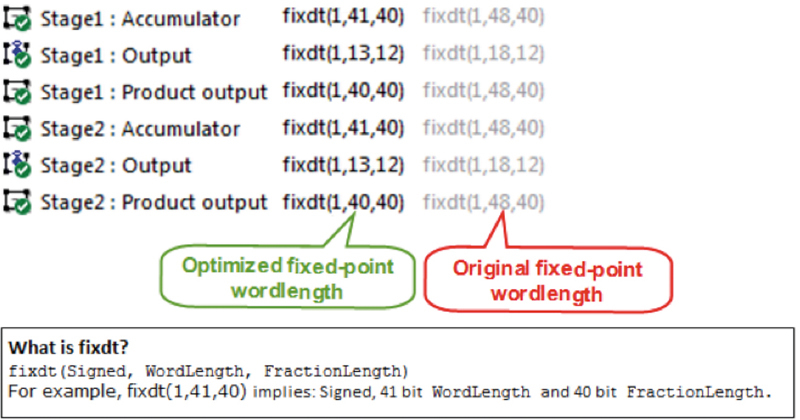 Figure 6 - Optimizing fixed-point data types using Simulink Fixed Point. In addition to selecting a fraction length, engineers must optimize the word length to achieve low-power and area-efficient designs. of the digital filter chain by as many as 8 bits (see Figure 6). For the DDC case study, we generated 5,780 lines of HDL code within 55 seconds. Engineers can read and readily understand the code (see Figure 7). Automatic code generation lets engineers make changes in the system-level model, and produce an updated HDL implementation in minutes by regenerating the HDL code. Figure 7 - Sample of HDL code generated using HDL Coder with Simulink. Functional VerificationHDL co-simulation enables engineers to reuse Simulink models to drive stimuli into the HDL simulator and perform system-level analysis of the simulation output interactively (Figure 8). While HDL simulation provides only digital waveform output, HDL co-simulation provides complete visibility into the HDL code, as well as access to the full suite of system-level analysis tools of Simulink. When engineers observe a difference between expected results and HDL simulation results, co-simulation helps them to better understand the system-level effect of the mismatch. For example, in Figure 9, on the following page, the spectrum scope view enables an engineer to make an informed decision to ignore the mismatch between the expected results and HDL simulation results because the differences lie in the stop-band. The digital waveform output, in contrast, merely flags the mismatch in expected results and HDL simulation results as an error. The engineer might eventually arrive at the same conclusion, but it would take more time to complete the required analysis. Engineers can use HDL Verifier, Simulink Design Verifier, and Questa /ModelSim to automate code coverage analysis. In this workflow, Simulink Design Verifier produces a suite of test cases for model coverage. HDL Verifier automatically runs Questa /ModelSim with this test suite to gather code coverage data for a complete analysis of the generated code. Having verified the DDC algorithm using system-level simulations and HDL co-simulations, you can now deploy the DDC algorithm on an FPGA target platform. FPGA-based verification (also referred to as FPGA-in-the-loop simulation) of the algorithm increases confidence that the algorithm will work in the real world. This enables engineers to run test scenarios faster than with host-based HDL simulation. Figure 8 - HDL co-simulation between Simulink and Questa/ModelSim. Figure 9 - Using a domain-specific scope to analyze system-level metrics and assess behavior of HDL implementation. Figure 10 - FPGA-in-the-loop simulation using Simulink and FPGA hardware. For the DDC algorithm, you use a Simulink model to drive FPGA input stimuli and to analyze the output of the FPGA (Figure 10). As with HDL co-simulation, the results are always available in Simulink for analysis. Figure 11 compares the two verification methods, HDL co-simulation and FPGA-in-the-loop simulation, used for the DDC design. In this case, FPGA-in-the-loop simulation is 23 times faster than HDL co-simulation. Such speed increases enable engineers to run more extensive sets of test cases and to perform regression tests on their designs. This lets them identify potential problem areas that need more detailed analysis. Figure 11 - HDL co-simulation vs. FPGA-in-the-loop for DDC design verification. Although it is slower, HDL co-simulation provides more visibility into the HDL code. It is, therefore, well suited for more detailed analysis of the problem areas found during FPGA-in-the-loop simulation. Following the four best practices outlined in this article enables engineers to develop FPGA prototypes much faster and with a greater degree of confidence than a traditional, manual workflow. In addition, engineers can continue to refine their models throughout development and rapidly regenerate code for FPGA implementation. This capability enables much shorter design iterations than a traditional workflow that relies on hand-written HDL. To learn more about the workflow outlined here or to download a technical kit, visit www.mathworks.com/programs/techkits/techkit_asic_response.html.